Teaching children to sew is a subject near to my heart for many reasons. The first is that had my mom not included me, as a young girl, in her sewing, my daughter would not have clothing that fit. Not to mention that I had a wonderful time creating Barbie clothes with the scraps. Next, as a "retired" kindergarten teacher, I believe children can learn anything of interest to them. And that children should be given the opportunity to learn things of interest to them. Young children are always interested in what we are doing, that's why they are always under foot. :) Sewing gives young children practice with many of the skills important to a young child's development such as following directions, fine motor skills, and creativity. Finally, the fun we've had designing and sewing together is priceless. 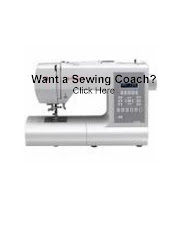 So, how do you teach your children to sew. In our house, learning to sew is like learning anything else. It's a part of our life. I sew or cut out something nearly every day. I cut at the kitchen table and sew in the basement, which is also the playroom. My children are always with me and therefore always part of what I'm doing. I don't require them to "help", but let them any time they ask. It does take a bit longer to complete a project, but a little extra time is worth it in order to pass on the love and skill of sewing. At age 4 the "real" lessons begin. When some mending, usually one of their stuffed animals, needs done, I give them a threaded needle and some quick instruction on going in and out of the fabric with the needle and thread. I'm by their side and ready to untangle threads, when needed. The goal is to let them fix their item their way. I don't over "teach", but let them build confidence, and get used to handling the needle and thread. I always use a contrasting thread color, so it's easy for them to see where their stitches are going. From this point on they have a drawer with fabric scraps, a few pins, and a needle and thread that they can use any time I'm sewing. Also at age 4, they get to sit on my lap and "sew" with me. The only rule is that their hands stay behind mine. As I am sewing I talk aloud through the steps I'm using, like...sew the shoulder seam with right sides together, or guide the presser foot along the fabric edge. Talking aloud while I sew allows them to become familiar with the language of sewing and the steps of producing a garment. Having their hands "help" me gives them a sense of accomplishment and the pride of helping create a garment, most often for themselves. The children also get to do "reverse" when I tell them and cut the threads. I don't use my thread cutter, so they can use the scissors. My son has this privilege now that he's 4. At age 5 we take another step forward, as I move my hands behind theirs. My hands are only helpers at this point. They are "driving" as we call it. They tell me which pieces go where, as I match them up and put them under the presser foot. By the way, we rarely use pins and almost always construct our garments in the flat. This makes garment construction easier on both of us. They are the ones sewing, reversing, and cutting threads at this point. I do a few of the seams, like attaching gathered pieces or more difficult things. But, any straights or gentle curves are all theirs. And, I run the petal. At age six is a big step...sewing solo, pedal and all. 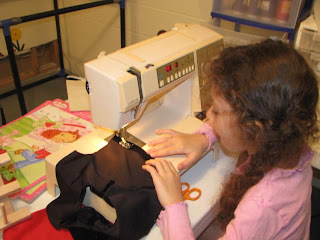 My daughter is pictured above in her first solo sewing experience, as she just turned 6. She made a dress for her 18" doll to match her own, made by both of us, Christmas dress. The only part I did was attached the gathered skirt to the bodice. I do stay at her side to offer words of assistance or encouragement. This was a big step for her and she did very well. We are both very proud and looking forward to the next project. Her current project is a dress she designed. Using her drawing, I created pattern pieces for her. She's laying the pieces, pinning, and cutting now. She'll be sewing them together soon. We're taking pictures as we go and will use the pictures in the upcoming SquigglyTwigs pattern. She plans to enter the dress in the Open Class part of our County Fair, and use it for Cloverbud interviews. Like I said, we sew/cut nearly every day. So sewing is a big part of our daily life. The children spend time with me choosing fabrics. They sit on my lap at the computer while we go through page after page making our fabric/notion choices. Nearly all of our fabric shopping is done online. We do some in store, even in thrift stores. Yes, thrift stores are great sources of fabrics for re-purposing into clothing. Our local thrift store employees get a real kick out of hearing my children talk about what we could make out of men's sweaters or a pair of maternity jeans. In fact, my daughter's favorite sweater dress used to be a women's sweater with fringed hem and sleeves. We also look through free designer clothing catalogs together. I let them choose clothing items they like and then look through my stash of pattern pieces to make those items. When you choose to "teach" your child to sew is completely up to you. Only you know if your child has the interest and readiness to be safe with a needle/thread or machine. But having them involved with every step of the process has worked great for us. When the children have helped choose the fabrics, design, and helped sew the garment, they love handmade even more, and have learned some useful skills in the process. Not to mention created priceless memories with you. Thank you, those are some wonderful ideas for teaching children. I hope to use some of them in the future when I have some kids. I love your post! I just bought Grace (8 years old) some Barbie-size wedding dresses at Dollar Tree. These tiny dresses are meant to be used to decorate champagne bottles and for wedding decor...but we are going to use them for her dolls. She can add lace or tule or gems on her own and make them fancier/more creative. If I can't help her on a project because I'm cooking or working, this is an easy thing for her to do since she doesn't have to start from scratch. I am just nervous about leaving my sewing machine down where little brothers can reach it and use the pedal like a race car! Our sewing room is in the basement. The machine is only to be used with my close supervision. If I didn't have a seperate space, I'd get it out for the period of time that I could be in close supervision/use it, and then put it away. No racing here. It's a machine to respect or no use priviledge. I know getting out and putting away is a pain, but sewing time with our children is worth the effort. I came across this because I was looking at ideas for teaching my niece, who is now 4. I started learning to sew at about age 3 and it's one of the most useful skills I have. I'm so grateful that I had the chance to learn and it's wonderful to hear that people are teaching their children.